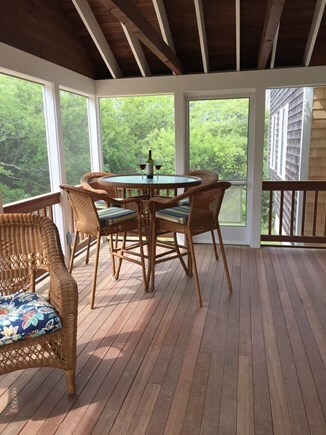 Start your day enjoying breakfast on your own private deck. Once you are done, one of the Bayside's best private beaches awaits you directly across the street. After your day at the beach, refresh yourself in an enclosed hot/cold outside shower. As dinner time comes around, either make the family favorites in a fully modern kitchen or outdoors on a Weber gas grill. After dinner, watch your favorite DVD or show on a brand new flat screen TV. This home features 3 bedrooms, 2 full baths, all hardwood floors and a recently remolded kitchen with dishwasher. 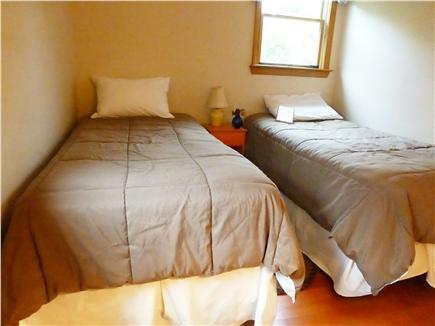 Other amenities include washer/dryer, cable TV, and Internet. What a Grand Vacation Spot! I can't say enough about the great experience we had with this home and with its owner, Len. We arrived to find the house to be even nicer than the pictures, very private and literally right across the street from a beautiful bay side beach. The pictures don't really show how spacious this property is with its beautiful screen porch and outside patio. We literally lived outside the whole time. There was nothing missing, and when I inquired about baking pans, a box arrived from Amazon the next day - talk about responsive! I was prepared to go buy tinfoil bakeware! 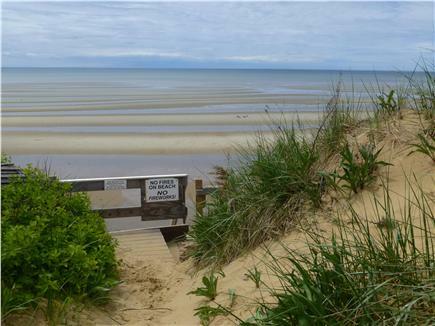 This spot is so lovely that there is really no need to leave, but if you do, Eastham has so much to offer! On the few rainy days we had, we went to explore the National Seashore and Provincelands visitor centers. We enjoyed many meals out and found absolutely no need to leave the Outer Cape for the whole two weeks. We had a great week in Eastham and the house was perfect. Len was very helpful and welcoming. 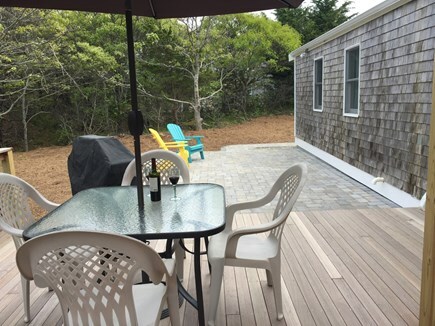 The steps to the beach are very close to the house, and the beach is one of the best on the Cape. Our children loved the area and friendly neighbors and biking to the general store. We will come again! Had a wonderful stay in this very pleasant cottage. Across the street from access to the bay beach -- which is totally awesome, especially at low tide. Perfect for long peaceful walks -- we saw some spectacular sunsets. Great Pond (a wonderful spot for swimming and hiking) is very short car (or bike) ride away. The cottage, itself, is very comfortable, quiet, and homey. Recently renovated, so everything feels airy and clean. There's a nice secluded deck in the back. This cottage is the perfect place to spend a relaxing vacation. We loved the open layout, as it allowed those in the kitchen to converse easily with those in the living room. 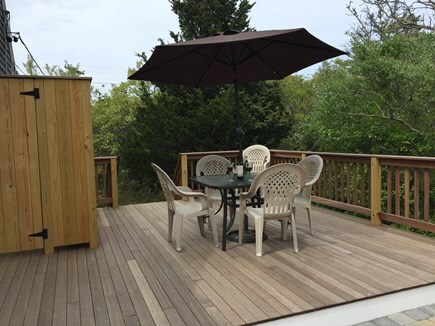 The back deck was one of our favorite features. Surrounded by trees, it is a perfect haven of relaxation. The outdoor shower is great too. The location of the cottage is a huge selling point. A 30 second walk takes you to a private beach that was never crowded. At low tide you can walk for a good 15 minutes before you reach water. The beach is at the bottom of a very tall dune and long staircase but is definitely worth the climb down. It's also a quick drive to many great restaurants and fun things to do. Clean, bright and across the street from the beach! 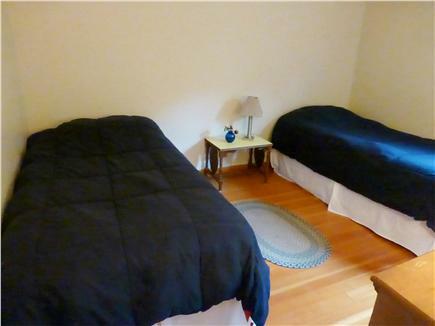 This rental is situated across the street from the stairs that lead to the beach. It is a great spot for families looking for the calmer bay side, and the house is very accommodating, clean and bright. The house has been recently renovated and has all the amenities you will need. Len made everything simple and easy and checked in to ensure we had everything we needed. 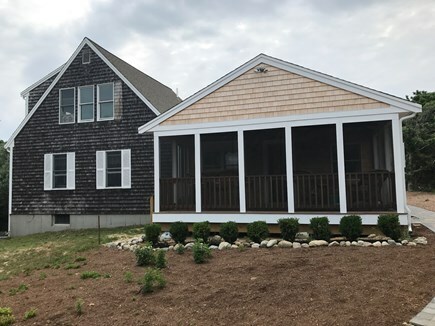 Our family has stayed at this location the past 10 years, and this home offers excellent location, private beach, close proximity to the bike path & a clean house that has been updated recently with all the amenities. Any issues are addressed immediately...great value! My husband, 6 year old son and I have been coming to Eastham for 5 years. This year we found the dream house for us! Directly across the quiet street from the association beach entrance, it was practically bay/waterfront, which we love. The house is clean, bright, comfortable, well appointed, quiet, and the outdoor shower is fantastic. We absolutely loved our week there and look forward to coming back again! Very nice cottage. Much larger inside than it looks from outside. Great location just across the street from access to a bay beach.